Since Iguana Sell seems to be breaking the news of these new releases, there is not yet any official information available from Pelikan. This is an M600 which means that it is a medium-sized pen in Pelikan’s line-up, an interesting choice for a lady’s pen. Keeping with the specifications of the line, it should be 5.28 inches capped, 6.10 inches posted, 0.49 inches in diameter, with a weight of 0.57 ounces. These hold about 1.30mL of ink. The cap, section, and piston knob appear to be made of white resin, reminiscent of the material of the Tortoiseshell White model. The striped section will likely be made from cellulose acetate as is the company’s convention. Like the other Souveräns, the furniture will be 24C plated gold and includes two trim rings at the piston knob, two cap bands, and a trim ring at the section, all standard Souverän fare. The cap top will also be plated in 24C gold. This model will follow on the heels of the M600 Vibrant Green which was released last year. I also expect this to be a special edition likely to only be produced in limited quantities. No surprises here either that the available nib sizes will be limited to EF, F, M, and B only. The nib will be the standard, modern 14C-585 two toned gold nib that adorns the rest of the M600 line. A K600 ballpoint pen in the same finish will also be available. Along with this release will be a new type of gift packaging adorned with pink laces. It is reported that this pen will be available sometime around September of this year. Personally, this is not the pen for me but I remain excited with Pelikan’s direction this year. I do question choosing the M600 model for a ladies pen as the M4oo would seem perhaps better suited to smaller hands but we will have to wait and see if the design pays off. This certainly could make a nice gift for that special someone come this year’s holiday season. What are your thoughts on this new pink model? I am surprised that they brought this finish out in an M600 sized pen. Only time will tell if that will impact sales but I do think it will keep some people away. That is the burden of a true collector but I completely understand where you are coming from. That would seem to be a very appropriate nickname. I’d like to see the white cap and piston knob photo shopped to black. Still not a pen I’d likely buy or even seriously consider, but it would be a step in the right direction. If it were an M2xx pen I would certainly have to buy it, compelled by my collecting goals. Thankfully that’s not the case here. The m2xx line has seen pink before though in the Deutsche Telekom release from 1994 and that actually looks pretty good. Pink can be done well. I’m sure there are some M2XXs you like more than others, but are there any you actually dislike on aesthetic grounds (like this new M600)? I hope ‘dislike’ is fair and accurately describes your feelings. Dislike is a fair characterization for my initial impression of the M600 pink. As for the M2xx line, there are no real deal breakers for me. The color I like the least is the green marbled but I don’t hate it be any means. I’m female and do prefer M600s but this color…(shudder). I love my Telekom. Beautiful little pen but like all the 200s, too small for me to use for extended periods. I think it’s mostly the white in combination with the pink that bugs me. It’s not a pure white but more the creamy white of the Tortoise. Perhaps if it was stark white and silver furniture it would work. I don’t know what it is, but it just isn’t right. It looks cobbled together. Fortunately, it doesn’t work for me anyway so I won’t be regretting that I don’t have the money to spend on it. So, you like that banana cream pie thing? The Citroenpers? The Citroenpers is a beautiful pen. A refreshing shade of yellow and a nice contrast to the rest of the line which is mostly darker colors. One of my favorites actually. I think I struggle to like yellow pens in general so a yellow that is so pale (to my eye) doesn’t work for me. I will say, they did get the overall look right. It isn’t a matter of mixing the wrong bits. I’ve had the Citroenpers for several years and have yet to ink it. It will be sold eventually as I am not a “pure” collector but a user. Someone who can appreciate it better will likely happily take it and the book off my hands when I can find the time to put it up on a sale site. The Green marble was my first and favorite for a long time. All in what strikes your fancy. 🙂 Like you, I don’t “hate” any of them. If someone gave me the pink, I’d find a way to use it. I keep gifts and use them. I bought the Citroenpers for myself so it holds no such sentimental value. Sorry. Babbling. Haven’t had pen conversations in months and just happened to see this pen on a Goulet blog page and had to find out more about it. I couldn’t find it on the Pelikan site so I wasn’t sure it was real. 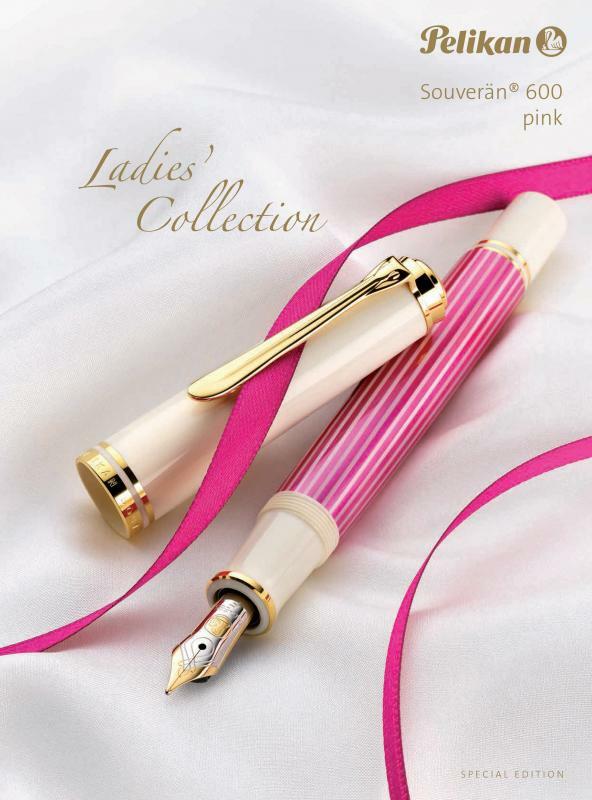 I love Pelikan pens and I think this M600 Pink edition is absolutely the most beautiful, feminine pen I have ever seen! I am currently on a mission to get my income tax refund and obtain this pen for myself. I think it’s gorgeous! The M600 Pink has definitely grown on me. It definitely looks better in person than in the product shots. I hope that you’re able to pick one up and enjoy it. Good luck! Mission accomplished…my Pelikan Souveran M600 Pink fountain pen is being delivered on Monday. I had to have this pen and it will soon be in my possession, thanks to my devoted hubby who spoils his wife shamefully! Congratulations! Only a day away. Enjoy your new M600. Just thought I’d update this, since I posted a couple of teases about getting my Pink M600. I know not everyone on this site is enthusiastic about this particular model, but I did want to post my impressions about it in case anyone is interested in acquiring one for their collection. First, I now know I paid too much for it: $500. I later found that I could have bought it for about $412 plus shipping from a vendor in England. Just FYI. 2nd, I am very impressed by the quality of this pen. The pink stripes are much more subdued than the picture portrays; instead of a “Barbie” pink, they are more of a subtle cherry-rose shade. I’m sure it was difficult to get this color to show up accurately in an photograph. 3rd, it does have a 14K solid gold nib (as it is an M600; I’m sure most of y’all knew this already). It has the code 14C-585 on the nib. I got a fine point and it writes like a dream. It is definitely a German-sized nib; the fine point is not extremely fine. Knowing what I know now about the size of the nib, I would have bought an Extra Fine point nib. That being said, I am still happy with the fine point; it writes beautifully and smoothly. The nib is not a flex, of course, but it does have a nice little spring to it. 4th, the “white” areas of the pen are actually a very pale, tasteful ivory-cream color. Very subdued, not yellowish at all. The cream color looks very nice with the more subdued cherry-rose color of the stripes. 5th, and finally, I am inordinately happy with my pen. It was a gift from my husband and so has sentimental value. Aside from that, though, I love the look of this gorgeous pen and the dreamy, smooth way it writes. I am still of the opinion that it is the most beautiful, feminine fountain pen I have ever seen, and I absolutely adore it. This is my second-ever Pelikan fountain pen, and I will be a committed, if rather small-time, collector. I now truly understand the appeal of these iconic fountain pens. My first Pelikan was the M200 Green-Marbled model, and while I loved it, I had not yet fallen totally in love. That came with the second pen, my Souveran M600 Pink Pelikan “ladies” fountain pen. Thank you very much for sharing your impressions of this pen. It has grown on me in terms of looks and does have a lot more appeal in person. The only thing that really goes against it in my eyes is the lack of the ink view window but that is a small quibble. If you enjoy then pen and can afford it, I wouldn’t worry too much about price. But, to illustrate your point of looking overseas for better prices, if you turn your eye towards Spain, this pen can be had for $355 from a very reputable dealer with very quick shipping. I agree; an ink window would have been nice, but it’s not a deal-breaker. And I will definitely look toward the foreign market in the future.